Trump: Ignore Rudy’s Shocking Confession About Stormy Daniels, He Just StartedSo much for the notion Giuliani had a clever plan all along. Giuliani Helps Trump Break Free — From His Own White House StaffGiuliani didn’t tell anyone about the strategy he plotted with the president, and now staffers fear they’re subject to the whims of two Trumps. Giuliani’s FBI ‘Stormtroopers’ Smear Is the Key to Trump’s Authoritarian MindsetHow Republicans can both fear the law as an instrument of terror while coveting it for the same purpose. Giuliani Accidentally Confirms That Stormy Payment Was IllegalRudy argues that the hush payment couldn’t have been a campaign finance violation because it wasn’t politically motivated; then, reveals that it was. Every Contradictory Thing Team Trump Said About Stormy DanielsA month ago Trump said he knew nothing about the hush agreement. Now Giuliani says he’s been reimbursing Cohen in regular installments. In One Hannity Interview, Giuliani Blew Up Trump’s Arguments in 3 Legal CasesThe new head of Trump’s legal team managed to contradict his positions on the Mueller probe, the Stormy Daniels affair, and the Michael Cohen case. Trump Reportedly Repaid Michael Cohen $130,000 for Stormy Daniels PayoutRudy Giuliani revealed on Fox News. Trump Team Signals That He Won’t Talk to Mueller Without a FightIt appears they’re building a case that Mueller is overreaching with his questions and subpoena threat, and prepping for a long legal battle. Giuliani Meets With Mueller, Tries to Determine If He Has an ‘Open Mind’He’s laying the groundwork to say Mueller’s bias is the problem. Giuliani Joins Trump’s Legal Team, Predicts Quick Settlement With MuellerHizzoner’s accession to his friend’s legal team probably won’t change anything other than getting the spotlight off Michael Cohen. Within Trump’s Orbit, Divorce Is the Hot New TrendDefense lawyers aren’t the only ones staying busy during the Trump administration. Let’s All Take a Moment to Remember Rudy Giuliani’s Last DivorceNow that he’s getting divorced again, a look back on the last time this happened. Rudy Giuliani Tries to Use Apple AirPods, FailsThat’s … one way to wear them. The Crime-Fighting Program That Changed New York ForeverIs CompStat’s main legacy safe streets or stop and frisk? White House Floats Rudy Giuliani As Attorney GeneralWhether Trump would actually nominate him may not be the point. Rudy Giuliani Helping to Defend Gold Dealer Accused of Violating Iran SanctionsAnother Trump ally is also on the case. Giuliani Says Travel Ban Was Legal Way to Enact Trump’s Muslim BanTrump apparently asked Giuliani to come up with the “right way” to implement an illegal Muslim ban, and the travel ban was the proposed solution. 5 Fun Facts About How Trump Picked His Secretary of StateHighlights include Giuliani’s ego, Romney’s non-apology, and Tillerson’s backers. 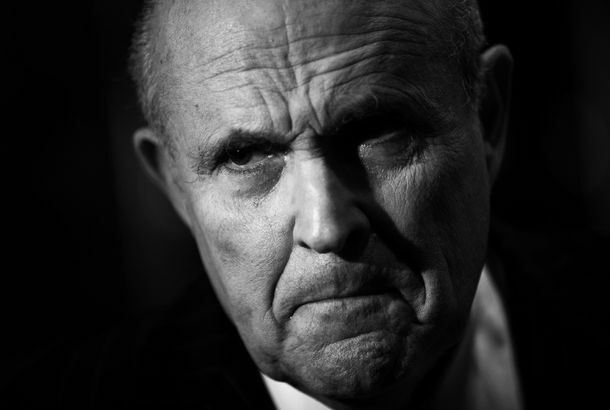 The Mystery of Rudy Giuliani’s Moral Decline Isn’t Such a Mystery at AllIf you’ve been watching him all along. Trump and Romney to Meet Again, As Secretary of State Reality Show ContinuesTrump is also meeting with Senator Bob Corker and retired general David Petraeus this week. Trump ‘Furious’ About Kellyanne Conway’s Attacks on Mitt Romney, Report SaysOn Sunday, Trump’s former campaign manager suggested that his consideration of Romney for secretary of State was a betrayal of his supporters. The Trump Cabinet Is Shaping Up to Be a Total SausagefestSpeculation over who will serve in the Trump administration involves a whole lot of old dudes. 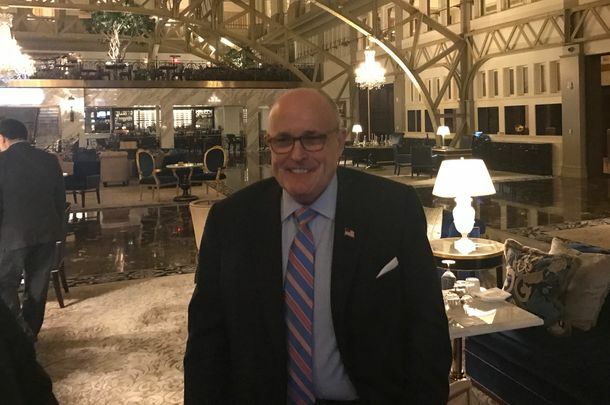 Trump Reportedly Lining Up Giuliani and Gingrich for CabinetWho’s ready for Secretary of State Gingrich and Attorney General Giuliani? Giuliani Thinks Unhinged Tweeter Would Make a Better President Than ‘a Woman’There we go. In Giuliani’s Alternate Reality, Trump Disavowed Birtherism Two Years AgoHe says Trump accepted Obama’s legitimacy two to five years ago, though there is no record of this. Rudy Giuliani Would Love to Electronically Tag Muslims on Watch List Getting back to his roots. 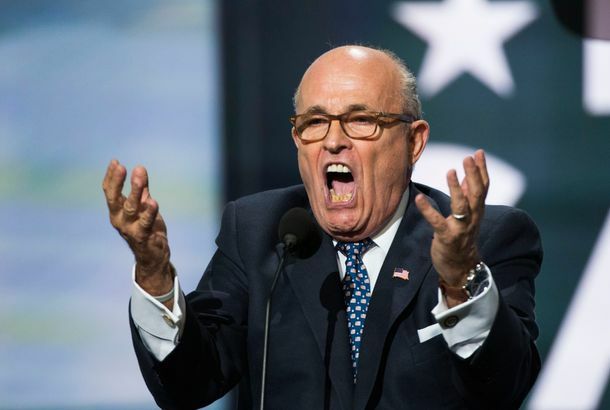 Giuliani’s RNC Encore? Singing Children’s SongsHe reportedly recorded a children’s album of lullabies earlier this year called AMERICA! GREATNESS! GO TO SLEEP NOW! Trump and Giuliani’s Bizarre Comedy SketchOh, Donald, you dirty boy, you! Giuliani Says Obama Should Be More Like Bill CosbyAmerica’s mayor has more non-racist theories to share. Obama Goes to Selma and Picks a FightA commemorative speech containing a sharp argument about race, history, and patriotism. 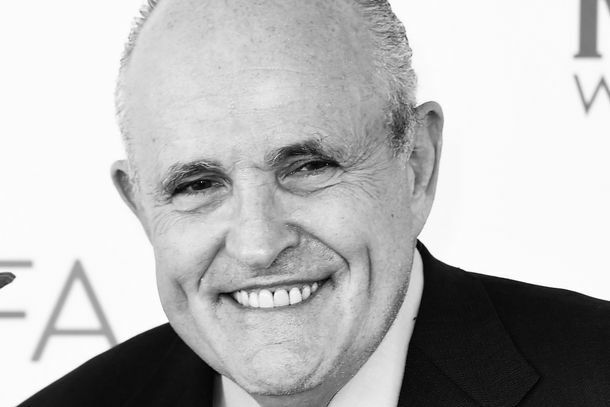 Frank Rich on the National Circus: Rudy Giuliani Is Now Trump, Minus the HairHe periodically pops his head up from his business empire to spew venom at the president. Rudy Giuliani Revealed Everything You Need to Know About Scott WalkerWhat paranoid murmurings about Obama tell us about the GOP candidates. Scott Walker Doesn’t Know If Obama Is ChristianConcerning comments Giuliani made at a Walker event. If Giuliani’s Obama Smear Wasn’t Racist, What Was It?The mayor makes the fatal error of uttering a sentence in a structure other than noun-verb-9/11. Giuliani Clarifies That White People Made Obama Hate AmericaSee? Totally not racist.